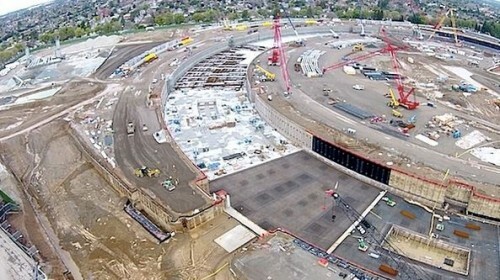 AppleInsider has recently shared a new aerial video showing the progress on the building of Apple’s new “spaceship” campus. As you probably know, a couple of days ago the guys from Cupertino posted a photo indicating that the work on the Campus 2 continues at enormous speed. Todays video once again proves this fact and gives us a more precise look at different parts of the construction site. The short clip is available here. Despite the adverse weather conditions, the construction workers continue earthworks and the building of the main “spaceship” ring of the campus. Moreover, they keep on working on the garage and other parts of the would-be headquarters. The guys from Cupertino are expected to finish the construction of their new headquarters in 2016. The “spaceship” campus will house 12.000 employees and become one of the most nature-friendly buildings of this kind in the world.